It seems like my eyes are always bigger than my menu when it comes to my produce buying habits! Every week I throw out something that has gone bad before I’ve been able to use it. Am I really just playfully tossing my hard earned money in the trash? It seems that’s exactly what it is.. MY MONEY IN THE TRASH! I would never just throw a few dollars here and there into the trash can when I walk by. Yet, isn’t that what we do when we throw out food? 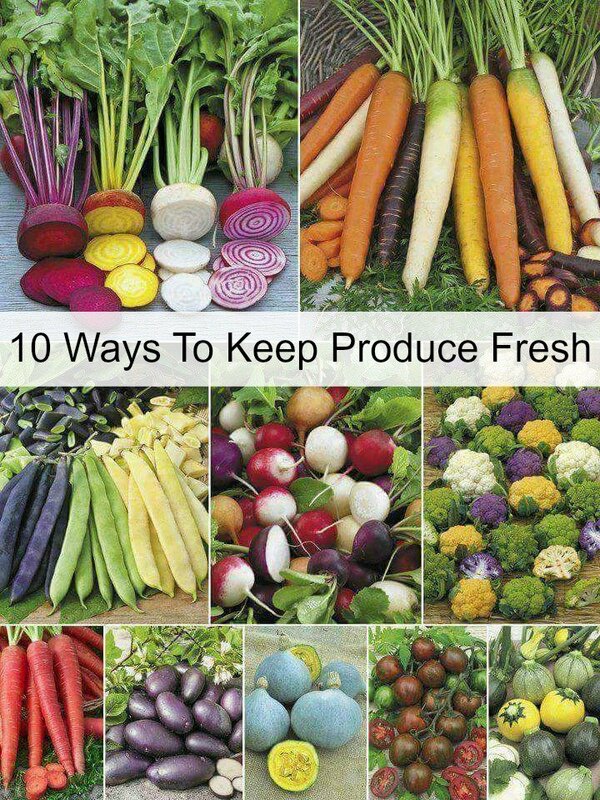 Here are 10 Ways To Keep Produce Fresh, and of course, help make your produce dollars go further. Buy only what you need! If you find that you’ve bought more than you’ll use, wash, chop, and freeze so it doesn’t get wasted. Take note of how much you’re using and adjust your shopping list. Familiarize yourself with the average shelf life of the fruits and veggies you buy most often. Tomatoes store best on the counter for 5-7 days while broccoli and brussel sprouts store best for 3-5 days when refrigerated in a crisper separate from fruits-as they will cause premature ripening because of the ethylene gas they produce. Consider adding an Ethylene gas absorber to your fridge. This will absorb the natural agents that your fruits and veggies give off as they ripen which quickens the ripening as well as gives your fridge that smell you never can find! Store in clear or glass containers. Keeping them in the crisper may be “best,” but out of sight is out of mind. There’s no way it’s best when I’m losing money! There’s a variety of containers that are specifically targeted for fruits and veggies. They’re designed to be vented in a special way that prevents premature ripening. I’ve tried these and found they really do make a difference when my goal is to keep my produce fresh. Keep your fridge clean. An organized and well lit refrigerator will help you see exactly what you have.That means you know what you need to eat first. Plus mold and food residue will cause your good produce to spoil faster. Buy a salad spinner. Water on your produce encourages mold. Wait until the day you’ll eat them to wash. The salad spinner will throw the water off your grapes and cherry tomatoes super fast, and they double as a colander which can be pretty helpful too. Store herbs in a small glass of water like you would fresh flowers. Keep them right on your counter and use them as needed. Keep apples, bananas, avocados, oranges, tomatoes, sweet potatoes and squash on the counter. You’ll keep from over crowding your refrigerator, and you will also encourage healthy snack choices because they are easily accessible and visible. Find a pretty fruit basket stand to keep on the counter. Always remove rubber bands and twisty ties from vegetables for better circulation. Keep fruits and vegetables separate. Fruits give off a higher level of ethylene (ripening agent) which will cause the vegetables to spoil more quickly. Especially bananas. They ripen very quickly and will affect anything around it. Bananas ripen fastest when they remain together as a bunch. Separating them at the stem will slow the process.